San Francisco Newspaper Company has named Marke Bieschke as publisher and Steven T. Jones as editor of the San Francisco Bay Guardian, elevating two longtime Guardianistas into the top spots, guaranteeing them editorial autonomy, and letting them work with the community to chart its future. As a first step in that process, the Guardian will hold a public forum on July 31 from 6-8pm in the LGBT Center, 1800 Market Street, to solicit input and discuss the Guardian’s unique role in the Bay Area’s political and journalistic landscape. Helping to coordinate the forum is Guardian writer Rebecca Bowe, who has accepted the position of news editor. The forum and subsequent discussions will form the basis for a strategic plan that will help guide the Guardian into a new era. The newspaper’s future was uncertain a month ago following the abrupt departure of longtime Guardian Editor-Publisher Tim Redmond in a dispute with the owners over layoffs and the Guardian’s autonomy. The company’s Vice President of Editorial Operations Stephen Buel, who is also editor of the San Francisco Examiner, was named interim Guardian publisher and Bieschke its interim editor. 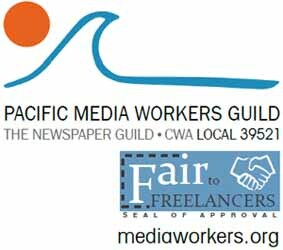 Heeding concerns in the community about whether the Guardian would remain an independent, progressive voice in San Francisco, Bieschke and Jones negotiated terms with SF Newspaper Company CEO Todd Vogt that guarantee them full editorial control, the addition of three new advertising sales positions and another staff writer, and guaranteed minimum staffing levels during a rebuilding period. Bieschke and Jones, who are in their early 40s and have been with the Guardian for around 10 years each, say they are excited for the opportunity to work collaboratively with Guardian staff and its community to rejuvenate the paper, attract new readers, and achieve economic sustainability. “Losing Tim’s leadership was hard on all of us at the Guardian, and we struggled with what to do next. But ultimately, the Guardian plays such an important role in San Francisco — particularly now, at a pivotal moment for this gentrifying city and its progressive movement — that we wanted to find a way to keep that voice alive, maintain our credibility, and reach out to a new generation of Bay Area residents,” Jones said. SFBG Editor Steven T. Jones. The San Francisco Bay Guardian was founded in 1966 by Jean Dibble and Bruce B. Brugmann, who continues to blog and serve as editor-at-large for the Guardian. The couple retired from regular duties when the financially troubled paper was sold to Canadian investors headed by Vogt in the spring of 2012, a deal engineered by Redmond, who is always welcome in the pages of the Guardian as he pursues a new media venture. Todd Vogt. Photo by Mike Koozmin. Bieschke joined the Bay Guardian in 2005 as culture editor, coming on staff after covering nightlife from a queer perspective in his Super Ego column, and he was made managing editor in 2010. His background includes online editorial and management level positions at Citysearch and PlanetOut Partners, as well as managing a bookstore in the Inner Richmond. “I’m also excited to help diversify San Francisco’s media environment by bringing two decades of queer Arab-American activist experience to the role,” Bieschke said. Jones is a Northern California native who was hired as the Guardian’s city editor in 2003, coming from Sacramento News & Review, where he served as news editor. Before that, he was a full-time staff writer for two other alternative newsweeklies, two daily newspapers, and one community weekly, all in California, since graduating from Cal Poly-SLO with a journalism degree in 1991. Years of cutbacks have distilled the Guardian newsroom down to just a few excellent journalists: senior editor Cheryl Eddy, who has shaped the paper’s film and arts coverage since 1999; Bowe, an award-winning investigative reporter who returned to the Guardian in January from a one-year stint with the Electronic Frontier Foundation; and Music Editor Emily Savage, who knows the beats of this city better than anyone; with Art Director Brooke Robertson leading the Guardian’s creative presentation. Comments for Bay Guardian Announces New Leadership, Community Partnership Goals are now closed. Whose endorsements will the endorsements be? Having watched Todd Vogt’s ham-handed siege on Bay Area media, I’m very glad to see the Bay Guardian has negotiated editorial freedom. I hope it holds. …Vogt’s hand in the loss of Tim Redmond. Vogt’s outrageous pimping role in the Shocked concert. I hope Bay Area media watchers will continue to keep Vogt and his company on their Google News alerts list.